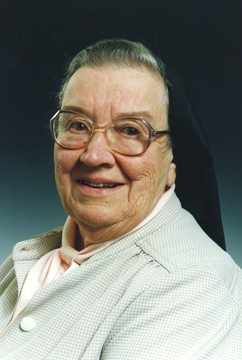 Sister Helen Kyllingstad, 96, a Benedictine Sister of Annunciation Monastery, Bismarck, for 64 years, passed into eternal life Friday, August 9, 2013, at a Dickinson care center. Mass of Christian burial is scheduled Wednesday, Aug. 14 at 4:30 p.m. in the Chapel of Annunciation Monastery. Visitation begins at 4 p.m. Monday at the monastery and continues until the time of the funeral. A wake service will be held Tuesday at 7 p.m. in the monastery chapel. She served as a nurse for 55 years, a hospital administrator for 25 years and an anesthetist/anesthesia teacher for 23 years. She was a lifetime member of the North Dakota Hospital Association, a member of the American Nurses Association and the American Association of Nurse Anesthetists. Helen, a daughter of John and Lena (Roe) Kyllingstad, was born Feb. 9, 1917, in Valley City, N.D., where she grew up with five brothers and one sister. In 1938 she graduated from nursing school in in St. Paul, Minn. She studied anesthesia at St. Cloud State, St. Cloud, Minn. and earned a bachelor’s degree in public health from Marquette University, Milwaukee, Wis. She served as public health nurse in Sargent County, Minn. and in Fargo and Mandan. Among other innovations in those post-Depression years, she encouraged grapefruit and orange juice for school lunch programs which helped children who were deficient in Vitamin C.
In 1967 Sister Helen began a 20-year career at Richardton Memorial Hospital as administrator and anesthetist. She loved the people of that area and tending to their health care needs. While in Richardton, she helped found the Badlands Association of Hospitals and Home Administrators in which she played an active role. After retirement, she continued her monastic life of prayer and service, often as a community driver and switchboard operator. She enjoyed reading, word and jig saw puzzles, and creating ingenious greeting cards from wallpaper. A nature lover, she used her electric scooter to go outside and bird-watch and identify and collect wild grasses. Sister Helen was also deeply proud of her Norwegian heritage. Throughout her life, Sister Helen inspired others to attempt what might have otherwise seemed impossible. “This is a good life,” said Sister Helen on her 60th anniversary of monastic profession. “I wouldn’t change it.” She urged women to follow their dreams. “If you have a dream, just try it. Take the risk.” Through her example of loving service to others, Sister helen encouraged and inspired others to trust in God's abiding love. Sister Helen is survived by nieces, nephews, cousins and the Sisters of Annunciation Monastery.